British undercover detectives in Birmingham have found cigarettes containing human excrement, asbestos, mold and dead flies, as counterfeit cigs flood into the UK at huge risk to public health. Private eyes working for the tobacco industry have spent weeks rummaging through litter bins and scouring pavements for cigarette butts to access the scale of the black market in England’s midlands region, according to the Birmingham newspaper the Sunday Mercury. Operation EDPC – which stands for Empty Discarded Pack Collection – was funded by Swiss-based brand protection company MS Intelligence – found that 31% of cigarettes were either bogus or bought abroad. Investigators were shocked by the sheer volume of the trade, which has more than doubled in the last 12 months. A similar study last year found only 14% of packets were fakes or had been smuggled into the country. 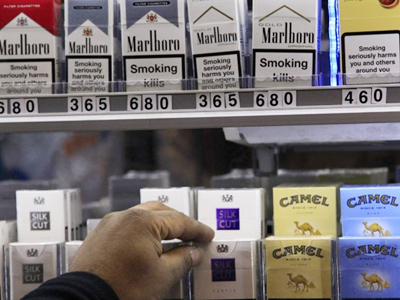 The trade in counterfeit cigs is big business. HM Revenue and Customs (HMRC) estimate that non UK duty-paid cigarettes cost the tax payer up to £3.6 billion during the financial year 2009-2010. Most of the brands originated in the Far East, particularly from China, which has had a problem with counterfeits for a number of years. The report warns that the criminals behind the smuggling have become much more sophisticated. The so-called ‘white van man’ going on a ‘booze cruise’ and bulk buying duty-free fags to flog to his mates has been replaced by organized criminal gangs. 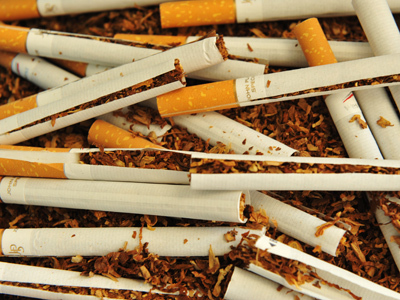 It warns that cigarettes – called ‘illicit whites’ in the industry – are manufactured for the sole purpose of being smuggled into another market and sold illegally to avoid tax. In 2006 ‘whites’ were only found in Poland and other East European countries but they have now been detected in at least 16 EU nations. Will O’ Reilly, a former Scotland Yard detective, who is currently carrying out research for tobacco giant Phillip Morris, said crooks who used to peddle hard drugs are now turning to tobacco. “Bring a container of cigarettes into this country and you’re talking £1.5 million profit,” O’Reilly told the Sunday Mercury. UK Government plans to introduce plain packaging for cigarettes will only make the problem worse. “Plans for plain packaging are simply playing into the hands of organized criminals and counterfeiters because it will be so much easier to make copies,” He said. A study carried out in the UK by the Tax Payers Alliance in April this year found £12.2 billion was lost to the illegal cigarette trade in the financial year 2009-2010, while as much as 50% of hand rolled tobacco is illicit. An investigation by UK trading standards chiefs in 2011 found asbestos in a haul of bootlegged cigarettes from Russia. Many of those tested contained toxins, including industrial chemicals and asbestos lined Chinese drywall.